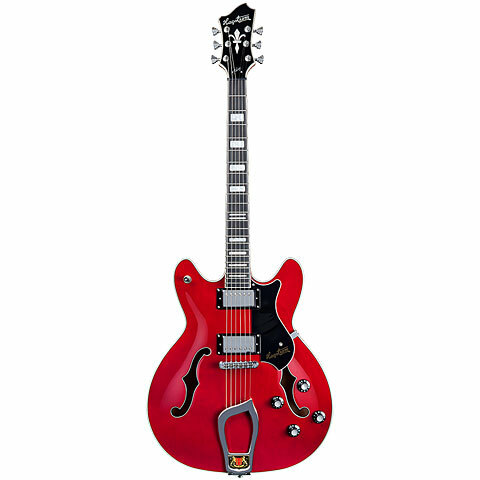 Back in 1958 Hagstrom first started manufacturing electric guitars in Sweden and it was already in the 60s when models such as the “Swede” or the “Viking” became top selling products. They were played by artists such as Frank Zappa, Elvis Presley, Larry Corryell, David Bowie or Abba. Now, more than 23 years later, the legend’s finally back! The Viking covers all areas from Blues to rock/Fusion to Jazz masterfully and convinces through a percusive tone with strength and persistence. The Viking Deluxe si made completely of flammed Maple and block in-lays on the neck, and also Jimmy F-holes. This item was given an average rating of 4.7 out of 5 stars. No review about this product has been written yet. 7 ratings exist without a text or these reviews are written in another language. · Show all articles of the brand Hagstrom.